Craftster Community > FIBER ARTS (Moderator: PerfectlyBohemian) > Meet Our Featured Artist in Fiber Arts - Belladune! I am first and foremost a mother to three beautiful wild children, and a wife to a wonderful man. Our home is also occupied by three cats a dog and some fish. We (my husband and I) run a plumbing company in a tiny little village (that morphs into a large town in the summer months. Whoop Tourism! ), and are involved in many local organizations (but not the same ones.. can you imagine?! we'd be with each other 24/7! ) I've always been crafty, and though my passion for making things has waxed and waned over the years I can't imagine a day without some sort of making. How did you get started in fiber arts? The medium itself. The possibilities that wool and fibres present are endless. The use of resists in wet felting, using the texture of the wool to create interesting yarns, the sculpting process of needle felting... that's just the tip of the iceberg, and I've only managed to cover maybe 1/4 of what's seen above the water. I suppose I do. Create something everyday, in any medium, even if it's not your preferred. Making something often leads to the next idea of what to make or another iteration of the same thing in a different medium. Because slowly it becomes a need not just a want. And it doesn't matter if it's hideous, just make it. Keep going and see it through, you may surprise yourself in the end. Do you have any advice for someone interested in getting into spinning? Dive in. Run out and get a spindle. Or heck, make one from CD's. You don't need a teacher. There are tutorials here, and all over the place on the internet. Make mistakes, make something that resembles yarn, and save it. Keep practicing and go back to that first ever proto-yarn and be in awe of where you started. What is the favorite project you've ever posted? Just one?! Such a toss up... I'm torn between my crafty Momma cupcakes, my Snailtaur (or more accurately Rlynns.. He was a swap gift!) and my Secret Keeper. Oh! and The Yarn That Craftster made! Besides Fiber Arts, what other boards on Craftster would we find some of your work? You can find me on the cooking boards, knitting & crochet boards... embroidery/needlework... sewing... I even played with clay a few times.. And I think there may be one or two of my projects in More art less Craft.. events and holidays. I certainly don't practice craft monogamy. 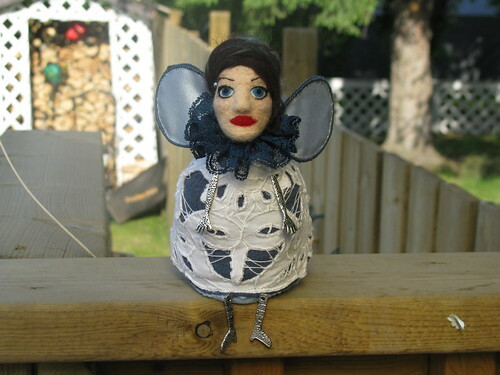 What is your favorite project on Craftster that's made by someone else? I love all the stumpwork embroidery pieces. What is your favorite spinning method? Woollen! Because it makes soft fluffy springy yarn. Needle felt vs. Wet felt? It really depends! I love both for different projects. You have time. There's always time for things you want to do, you just need to notice that you have control over it. Re: Meet Our Featured Artist in Fiber Arts - Belladune! Awesome pick! I love her stuff! All your work is beautiful, Belladune! It's great to learn more about your background and introduction into Craftster I'm really inspired to go actually finish my first spinning project now. Your yarn is gorgeous! Loved reading about you and your work! So happy to see Bella featured!! She has so many crafty talents but I gotta say, I'd love to dive into a pool of her yarn. It always looks so luxurious and colorful!! I am so glad to read how you got started in your craft! I am so lucky to have been gifted some of your fabulous hand spun yarn...I love the cowl I made from it. Also, your needle felting is a great off-shoot of your yarn love...lucky me also got a fabulous felted doll you made! Thanks for sharing your story...and hope that you will follow your philosophy of making stuff always! Yay! I loved reading this so much! Thanks so much for sharing Belladune, I love your work. I always thought of you as Queen of Fiber Arts, so it was a joy to get to read a little bit about you and your art. Your work is impeccable and your yarn is divine! This is awesome, I love Bella! I also love hearing about how people find Craftster! Gosh! You guys are filling my cup up today!! <3 I was so thankful for the feature, and then to hear all your compliments... So much love!! You all inspire me so much too. <3 <3 <3 ! !